My Weekly Indicator post is up at XE.com. There was some fluctuation among the coincident indicators this week, but with the Fed decision, the reaction of interest rates takes center stage. I have not been a happy camper here at Camp Bonddad this week. First, contrary to my expectation, the Census Bureau reported that real median household income actually *declined* by about -0.5% for the prime working age 25-54 cohort. The main reason, apparently, was a seemingly random increase in the percentage of non-family households, which disproportionately consist of low wage earners. Then the same Census Bureau wreaked havoc with housing permits, perhaps the most important among long leading indicators. These went from making new highs several times in the second quarter, to no new high having occurred since 10 months ago. Did I mention, these are invaluable for looking at the economy 12+ months out? So, suddenly, we are only 2 months away from no new highs for a year. Awesome. 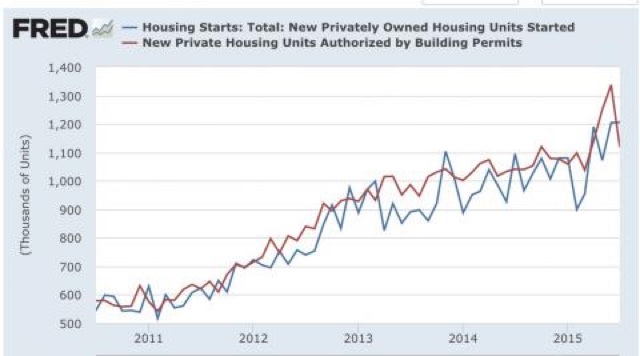 Except, oh by the way, housing starts still show the improvement, as do the non-seasonally adjusted numbers, even after the latest revisions. Would it really be too much effort to supply us with an explanation? So let me point out two things which *did* go right this week, courtesy of a -0.1% decline in CPI: real retail sales and real aggregate wages. This bodes well for employment growth in the coming months, since consumer spending leads jobs. Since population increases by a little under +0.1% per month, this means real retail sales per capita, a long leading indicator, also made a new high in August. 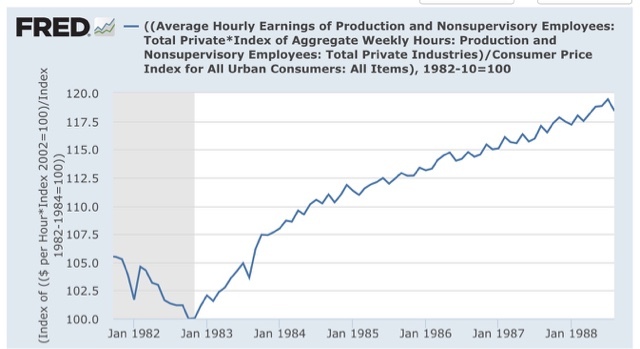 At this point (5 years, 9 months into the employment expansion) in the 1980s, real aggregate income was up +18.5%. 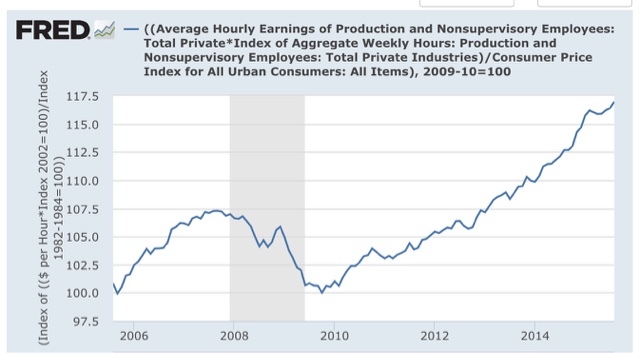 Our present expansion isn't quite so good for aggregate real wages, but not too shabby either. Note that this year was one of the two biggest outliers to the negative. 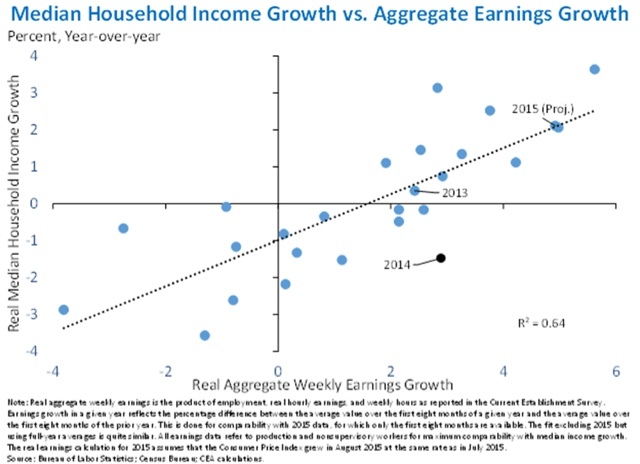 Typically based on real aggregate wage growth we should have seen decent growth to real median household income. When you make a revision of over 25% to one month's data, that turns a surge into a crater, but the non-seasonally adjusted data still shows a surge -- such that the YoY data, which ought to be unaffected by seasonal adjustments, is out of whack by 35% (!!! ), don't you think you owe your readers an explanation? Well, Census Bureau, I"m looking at you. 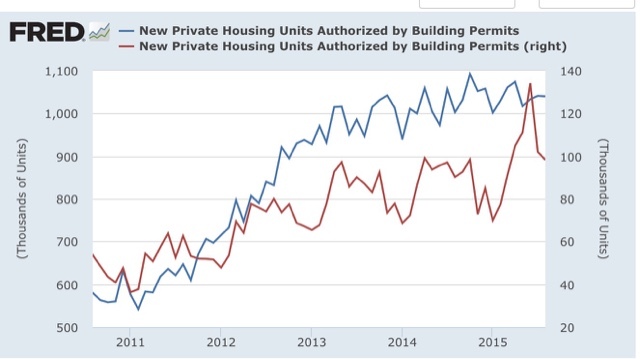 Permits had spiked to over 1.3 million in June, which was due, we were told, to the expiration of a program in NYC that required permits to be issued no later than June 30. The spike in seasonally adjusted permits is completely gone, replaced by a crater. This is no small revision. 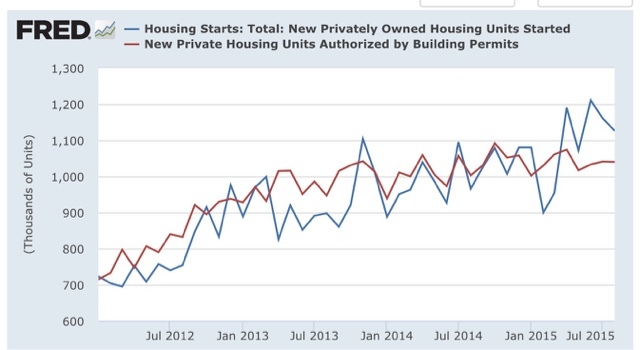 Rather, housing permits for June have just been revised down by 25% -- a full quarter of the total! That's one heckuva revision! Like I said, that's one heckuva revision! OK, revisions happen. Fair enough. But notice that starts -- an actual, physical event -- still reflect a significant increase in the last few months. It's one thing if permits were never acted upon with actual starts, but here we have suddenly non-existent permits leading to actual starts! The wholesale deletion of the NYC permits has created a 30% discrepancy in the YoY comparisons of seasonally adjusted vs. non-seasonally adjusted data! 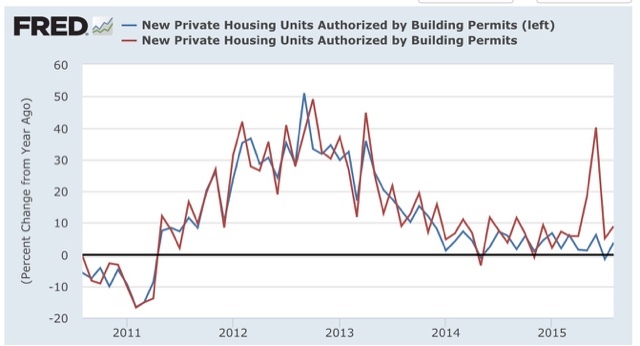 Considering housing permits is perhaps the single most important long leading indicator, and with the revisions this morning completely wiping out any progress since last fall, it seems to me that the Census Bureau has some explaining to do. I have looked in vain for any explanatory note in this morning's release. It's possible I missed it, of course, but at least one other blogger has confirmed to me that they did not see any such note either. So excuse me, Census Bureau, but I have a bone to pick with you. Real life intrudes, so I can't do a detailed analysis now, but this morning the Census Burreau came out with their annual update on median household income for 2014. The headline is that real median household income for all households decreased by -1.5% in 2014. But the number of people aged 35 - 54 decreased by about 150,000, while the number of households with people over 65 grew by about 900,000. Since median income for "over 65" households was only about $39,000, while prime working age median income was about $66,000, that significantly distorts the overall number. That is still a slight overall decline. As I anticipated, the numbers are the year-long average, not year-end to year-end. Thus, for example, the calculated inflation rate was +1.5%, even though at year end 2014 the CPI was only up about +0.6% YoY. I'll have more later once I am able to take a more detailed look. Overall this certainly looks like a disappointment. Edward Welniak, chief of income statistics for the Census Bureau's housing and household economic branch, attributed the leveling of median income in part to a 1.2 million increase last year in non-family households, which typically have much lower income than family households. "What we see there then is this increase in households at the lower end of the income distribution tended to hold down median household income," he told reporters. I have no diea what is behind this anomalous increase in sincgle male householdss. My first guess would be young men moving out on their own, but age group 25-34 was one of the few to show an actual increas in income. Perhaps an increase in younger (i.e., under 25 men moving out of the basement? Another important breakdown is income across the board including part-timers, vs. income of full-timers only. 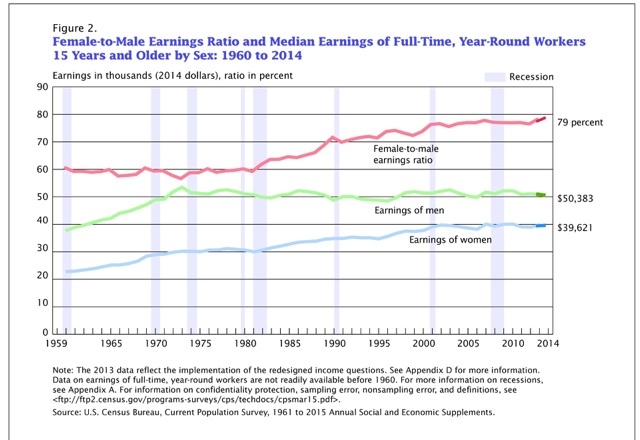 The median wage for male full-timers actually fell slightly, while that of full-time women workers rose slightly -- but not enough to overcome the deficit by men. In other words, the rise in incomes among wage-earners in 2014 is not being driven by raises, but rather by the conversion of part-timers to full-time work, and/or by the increase in hours worked by part-timers. This is important information. It explains why median weekly income has been flat to declining, while median hourly income has been increasing. "At the mouth of one witness he shall not be put to death"
Tomorrow night the state of Oklahoma is set to execute Richard Glossip for the murder of a former boss. A coworker admittedly was the actual killer. There is no physical evidence tying him to the crime. He is being executed based on the testimony of a single witness: the triggerman claims Glossip put him up to the job. This is a case where the wisdom of the ancients remains true. Human nature has not changed. Nobody's life should depend on the perceived credibility of a single other person, particularly where that single person has an incentive to be untruthful. Where are the Christian fundamentalists now? 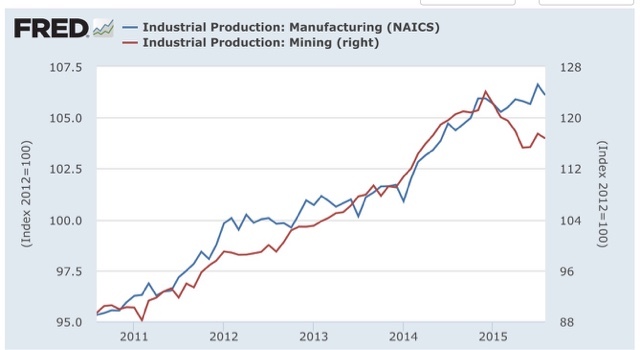 When CNBC breathlessly reported industrial production this morning, it was with words to the effect that it was "the biggest decline in almost two years," On the contrary, while it supports the idea that the US is in a "shallow industrial recession," it does nothing to suggest that there are broader problems. 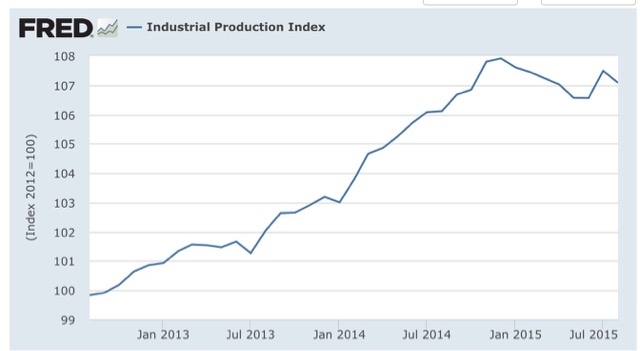 we see that manufacturing remains in an uptrend. The big decrease is mining, i.e., it is all about the Oil patch. (Production by utilities was up this month). In short, not great, but not too shabby either. P.S. 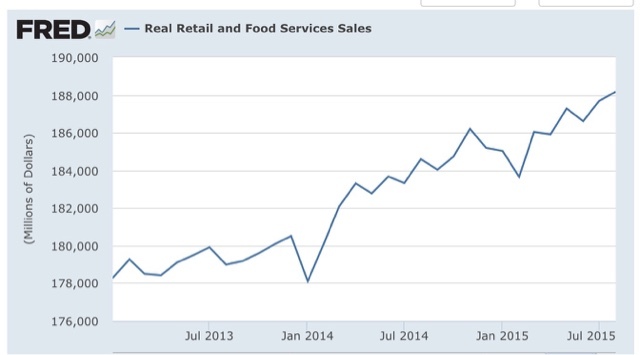 I'll waith to comment on the retail sales number until I see this months's CPI. Powerline was one of several conservative blogs that broke the "Rathergate" story. Several weeks before the 2004 presidential election, Dan Rather and CBS news reported something negative about George Bush's Texas National Guard duty. I don't remember what it was, but Rather based the story on a set of documents. Somehow several conservative blogs including Powerline obtained the documents and determined they were forged. IIRC correctly, Time magazine named them blog of the year. Here's a link to the Wikipedia entry for more detail. The conservative blogs used this story to further the"liberal bias" meme. In the pages of the Las Vegas Sun, a man named Larry Pfeifer announced that he had successfully duped a conservative blogger into running a story that Senate Minority Leader Harry Reid's recent injuries to his eyes and face were the result of a dustup with his own family. Hinderaker would have recognized Pfeifer's name; he had published Pfeifer's account on Power Line only a few weeks earlier. Rather lost his job because of the story. Hinideraker is still writing for Powerline. I'm sure the boys at Powerline they have formulated some type of juicy rationalization to describe the difference between Hinderaker and Rather. But, they're the same fact pattern. Why is this important now? Because Powerline is cranking up a series of posts on the movie "Truth" which is based on the Rathergate story. I'm sure there will be lots of reminiscing about how important their blog was to the story. There will probably be no mention of Hinderaker's Dan Rather impersonation earlier this year.